Hi y'all~ I finally sat myself down to write this review. I was hoping I would have the 2017 S/S colours before I write this post but unfortunately with Canadian Customs and Canada Post, I am still waiting for those. So we will have to make do with the original Peripera Peri's Ink Velvet colour I have. 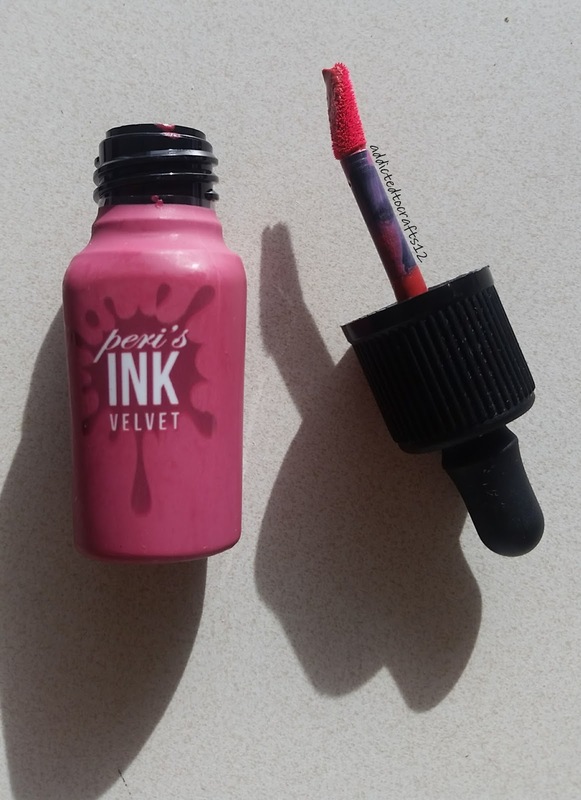 I bought and reviewed the original Ink Velvet in #7 Dollish Beige Rose back in November and I love it. I saw the 2017 S/S colours came on and I purchased 2 colours immediately. 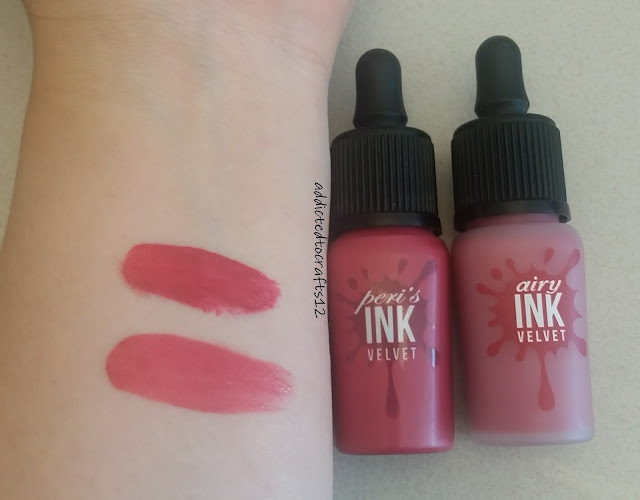 When I saw the Ink the Airy Velvet came out, it didn't really attract my attention as it was similar to the shades I already purchased. But the more I looked at it, the more I couldn't resist #5 Elf Light Rose and purchased it from Cosmetic.Love on eBay. 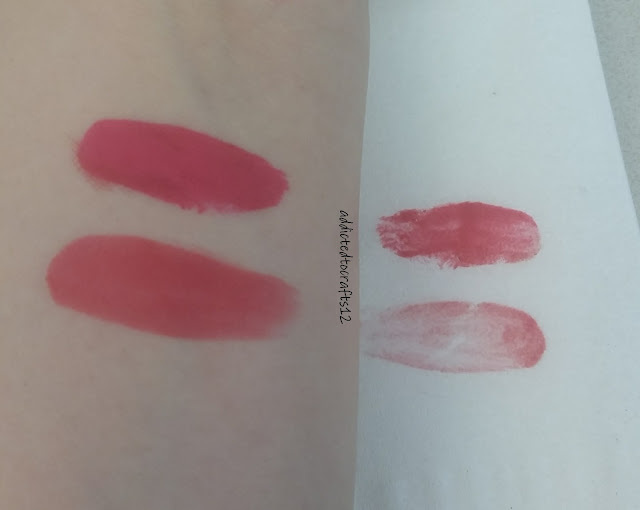 Let's compared the colours based on Peripera's official swatches. As you can see, Ink Velvet #7 is more of red while Airy Ink Velvet #5 is more coral? The two bottles are the same size, both containing 8.0g of product. 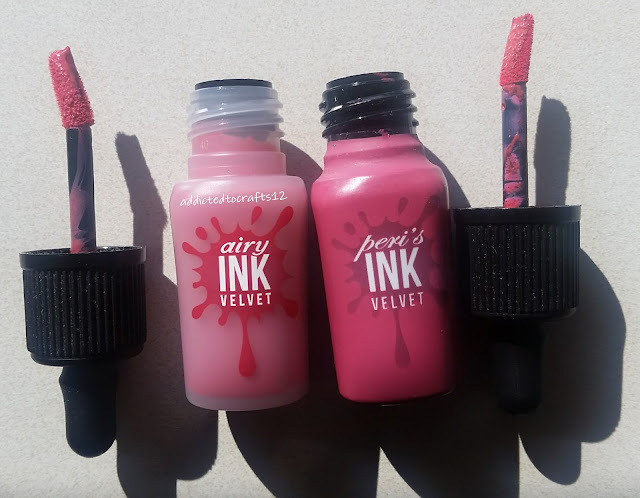 The difference is that the original Ink Velvet is in an opaque plastic bottle while the Airy Ink Velvet is in a clear plastic bottle. If you look closely on the above image, you will see the applicator is slightly different between the two. The applicator for Airy Ink Velvet is just a tad longer than the original's applicator. It is also slightly fatter and more slanted. The original Ink Velvet has a strong artificial sweet smell to it, I want to say it's supposed to be strawberry candy smell? I can tolerate it. So in the scent department, the original Ink Velvet has a big win. The original Ink Velvet has a mousse like texture when it's applied on my lips. Just need a small dab and then spread it out with a brush or cotton swab and it dries out matte. Whereas the Airy Ink Velvet has a lighter and smoother texture. I want to say they added a bit more oil into the formula? 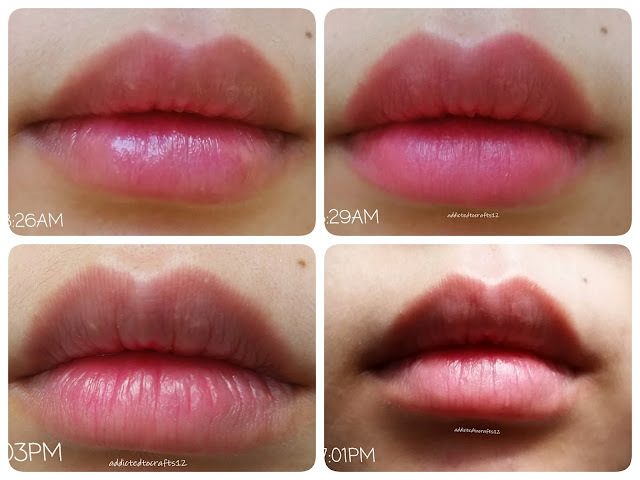 It does dry out matte as well but because it is a lighter texture, I need a full swipe with the applicator for the same amount of colour payout. I think in the texture department, I prefer the lighter texture for the Airy Ink Velvet but wish it has the same colour payoff as the Ink Velvet. 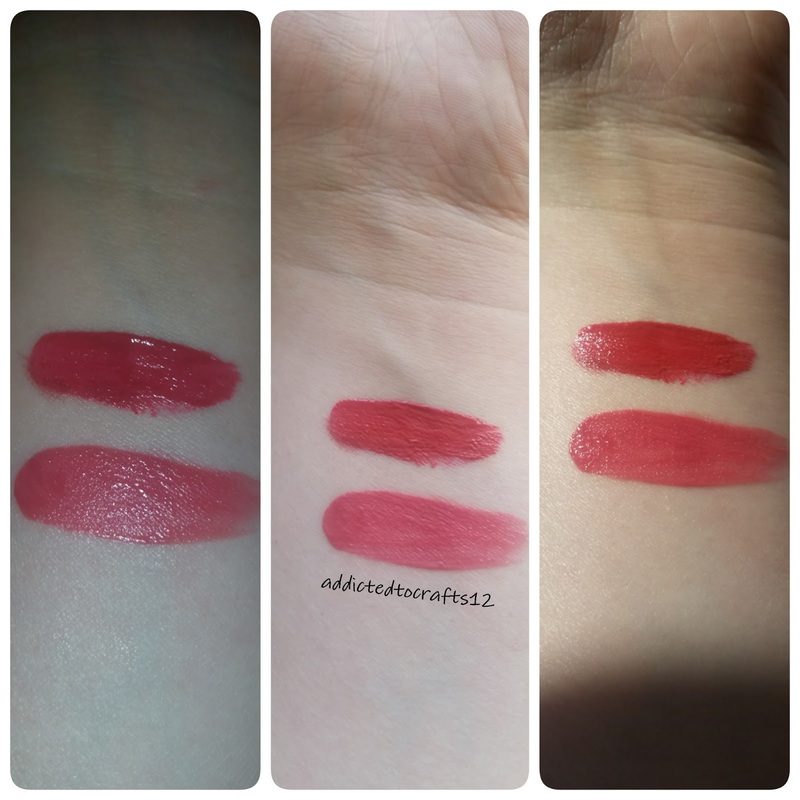 The top colour is the original Ink Velvet #7 Dollish Beige Rose, while the bottom is Airy Ink Velvet #5 Elf Light Rose. Here are the swatches in three different light settings. From left to right, it is with flash, natural light, and in direct sunlight. I think if you look at the flash picture as well as the direct sunlight picture, you can see the difference in the pigmentation between the two colours. This is pressing a tissue on the swatches after I finished taking the swatches, and you can see how much came off from the Ink Velvet on top, in comparison to the Airy Ink Velvet on the bottom. But can you see that despite how much came off, the Ink Velvet is much more pigmented and opaque than the Airy Ink Velvet. This kind of relates back to what I was saying before, that the Ink Velvet only needs a little bit for a good colour payoff. Whereas the Airy Ink Velvet requires far more in order for the same colour payoff due to its lighter texture. This is what's important to us besides pigmentation of the lip tints. The original Ink Velvet lasted me a full day. So I thought I should compare it to the longevity of the Airy Ink Velvet. First up is the original Ink Velvet. 😊 This is why I fell in love with Peripera and sets the base line for the two lip tints. 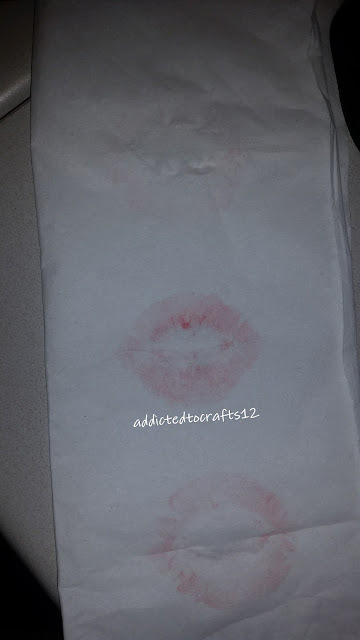 This is smacking my lips on the tissue paper to remove excess lip tints. This was done five minutes after application. It is little weird but the center is right after 5 minutes, bottom is after the center, and top is after bottom. Does that make sense? 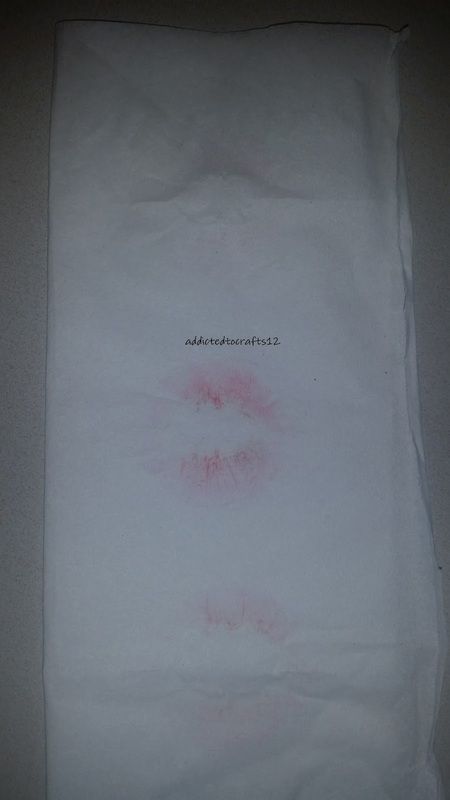 As you can see, after 5 minutes, there was still a little bit of excess lip tint that came off in the middle of the tissue. Afterwards, there was a tiny bit of lip tint coming off. After that, there was nothing coming out. Here is a collage of my lips with Ink Velvet throughout the whole day. I started at 8:26AM with bare lips. The colour was still present after lunch at 1:08PM, the bottom lip is a bit dry but that was resolved with just a tad bit of lip balm. 😝 At 4:42PM, this is over 8 hours and the colour is still present on my lips. It may not be as vibrant as the morning but you can still tell there is colour on my lips. At 10:42PM, I think there was still a little bit of colour left, and this is after 3 meals and lots of water. Can you get why I love Ink Velvet so much? The Ink Velvet has set the bar super high with over 8 hours of wear, let's see how Airy Ink Velvet compares. 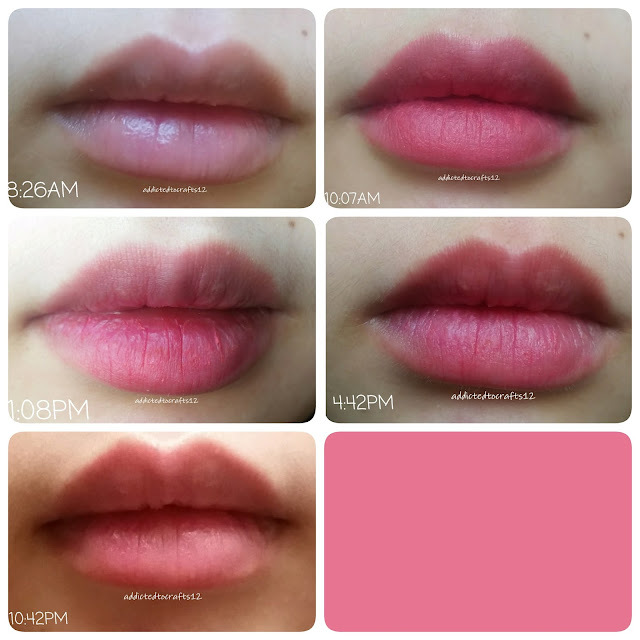 At 8:26AM I had bare lips, with just a tiny bit of lip tint remained from the previous night's first impression swatch. I have put the Airy Velvet Tint at 8:29AM and it is a nice pink colour. However, by 1:03PM, the colour is pretty much worn off. And by 7:01PM, it's completely gone. So this barely passed lunch and drinks. So I would say this only has about 4 hours of lasting power, which about half of the Ink Velvet's power. Again, I am pretty sure it's due to whatever Peripera did to the formula to make it lighter texture. Needless to say, the original Ink Velvet is the clear winner in this battle of lasting power. The overall winner for the two tints is the original Ink Velvet. It has a much more pleasant scent, and has great colour payoff. I absolutely love how long last it is. I do like the lighter texture of the Airy Ink Velvet but the fact that it has a soapy scent and barely last through one meal makes it a loser in this case. No problem! Happy to help! ^__^ Just FYI the 2017 S/S shades in the original Ink Velvet has similar shades as the Airy ones, but with a bit more coral undertone.